I wonder if the thermostat registered that chill in the atmosphere as eyes collectively narrowed and dozens of hatless heads swiveled in his direction. On a lighter note, a non-Texan friend, respectful but whimsical, couldn’t resist the observation that Travis missed a strategic opportunity–he could have posted a sentry on the roof of the Crockett Hotel…. The Crockett did provide a (non-military) solution when my daughter’s birthday came around this year. Having changed jobs in the past year, she’d had no chance of a vacation in many months; I proposed a micro-vacation/overnight getaway. 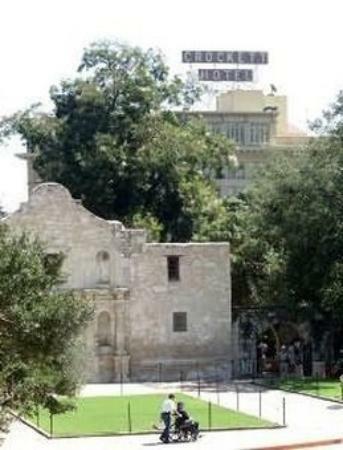 San Antonio’s museums, Riverwalk, and a re-visit to the Alamo were her choice. The ghost tour was a lucky last-minute add-on. Shepherded by a young lady attired in a hoop skirt and equipped with an iPad (to display historic photos), about twenty ticketholders met in Alamo Plaza to stroll through downtown, pausing from time to time to admire facades and be regaled with tales imparting equal amounts of history and hauntings. The phantom chambermaid at the Menger Hotel, the swimming pool constructed from old hospital operating tables at the Emily Morgan Hotel, gory hangings and interred ashes at the Holiday Inn Express (former Bexar County Jail), reported apparitions at San Fernando Cathedral and more–all were recounted charmingly as though they’d been just discovered by our guide, not rehearsed nightly. We didn’t follow up on photo-snapping opportunities; somehow, pursuing digital capture of phantom images seemed unfair. But the structured meander through the quiet streets, graced by illuminated horse-drawn carriages and the rapt attention of fellow tourists, was delightful. Besides, ghost stories are a wonderful introduction to any city; they invite one to focus s exploration on sites and past events that promise a personal connection. I know. The tour idea needs (a) paranormal activity and (b) professional help. Who we gonna call?